It’s usually seen that we are quite serious about weight, heart, blood sugar and other such serious issues; but we hardly bother to get a regular eye checkup. Only if we get some problem like a red eye, we try to find remedies for broken blood vessel in eye or visit an optician if our vision seems to be blurring. But, our eyes are really invaluable and you can imagine, what our condition would be if they are lost. Eyes are exposed to many small and big problems. Here are some such problems and their cure. 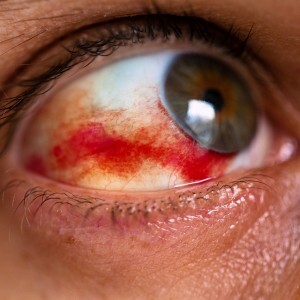 This condition is also called subconjunctival hemorrhage and is caused when one or more small blood vessels in the white part of the eyes break because of vomiting, coughing, sneezing or straining or bending over; but sometimes it can cause for no reason. This is usually not a worrisome problem and may get cleared within a couple of weeks. If it is not very serious, it doesn’t cause pain or problem in vision or a lot of bleeding covering a larger portion of the white; only if the bleeding reaches the colored portion of the eye (iris) it is serious. BestHomeRemedies.net has many excellent yet easy home remedies for popped blood vessel in eye. Sometimes your eyes suffer from a continuous discharge of tears. This takes place when eyes are sensitive to wind, temperature changes or light. This can be lessened by using sunglasses to protect eyes. Excessive tearing may also indicate a serious problem, like infection or blocking of tear duct. Both these conditions can be treated by your ophthalmologist. If your eyes are itching a lot or you feel that they are dry or burning, it might be a sign of dry eyes. Dry eyes are caused by the inability of tear glands to create tears in enough quantity or the glands create poor quality tears. Your eye doctor may prescribe you eye drops that imitate real tears or suggest the use of humidifier in home. S/He can also block your tear ducts with plugs which results into less drainage of tears. Floaters are tiny, seemingly transparent specks that we notice floating in our eyes. Usually they are not problematic, but they can sometimes indicate a problem, like retinal detachment, particularly if you notice black shadows or light flashes at the edge of your vision. If you see a sudden change in the type or number of floaters, it is advisable to visit an eye doctor as quickly as you can. Presbyopia is a normal and common condition that occurs with aging. It is when you are no longer able to see close objects and fine prints clearly. It usually occurs after 40 years of age. A common solution to this problem is reading glasses. It can also be improved with LASIK and some other procedures. Cataracts are milky lumps that develop in the eye lens. Because of this lump light cannot enter retina which is at the back of the lens and therefore image cannot be produced and you cannot see. Development of cataracts is often slow and painless, without any other symptoms like tearing or redness. Sometimes cataracts are small and don’t obstruct vision, while sometimes they may grow thick or large, and have to be removed by surgery. Choosing cosmetics wisely – Some eye cosmetics may cause allergy to eyes or may be harsh on them; women should first try only a little sample of eye cosmetics and use them only if they don’t cause any problem. Cucumber or rose water – As mentioned earlier, eyes can’t bear high temperature; to keep them cool you can use cucumber slices or cotton balls soaked in rose water to keep on closed eyes for 15 to 30 minutes. Take enough sleep – Not getting enough sleep can affect eye health adversely; so, try to take enough and high quality sleep in a dark room.